^and so it begins. I see Vanessa has the same friends as Jennifer Anniston, et al, divorcing Hollywood broads. Child support, I would guess. More kids, more money. I do feel bad for those kids, though, having that moron for a dad. Having the genes alone I pity them for. But this too. I'm hoping she goes for some kind of settlement that keeps him from being able to use the kids/post public pics. Donald Trump Jr had an affair with singer Aubrey O'Day reports Perez Hilton. 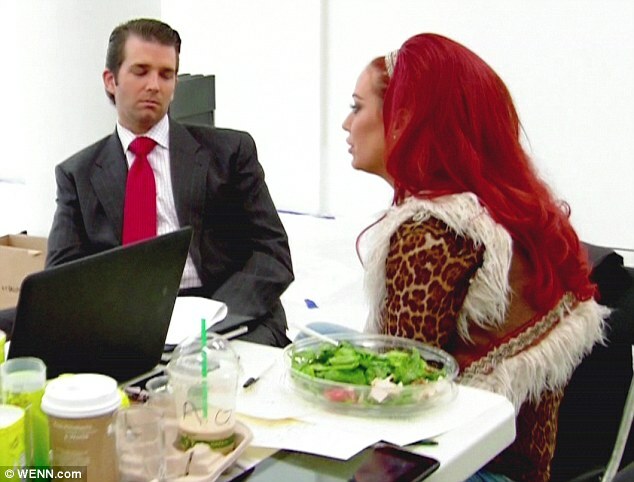 That romance nearly caused Don Jr and wife Vanessa to divorce back in 2012 according to multiple sources, who said that the pair began their relationship when O'Day appeared on Celebrity Apprentice. Those same sources said that O'Day only agreed to the relationship because Don jr told her that he and Vanessa were in the process of separating at the time. 'Apparently, the 40-year-old was very aggressive in pursuing the former Danity Kane artist - telling Aubrey he loved her and that he wanted to be with her,' reports Perez Hilton. Multiple reps for The Trump Organization did not respond to a request for comment. O'Day had previously hinted at having some damning information about the Trump family following the election. O'Day later deleted that second tweet. The tweet still managed to spark rumors of a possible affair between O'Day and one of the Trump men, though no concrete evidence has ever been provided to prove that there was any relationship. Shortly after Perez Hilton broke the story, Page Six released new details and confirmed others about the alleged affair. 'It was him who chased her,' said one source familiar with the situation. A second source claimed that it was Don Jr's father who had to eventually step in and tell his son to 'knock it off,' encouraging him to return to his wife Vanessa. The Page Six report also reveals that sources told them O'Day was very much in love with Don Jr and never after his money. She also never received any money from him to keep quiet according to those same sources. There have not been any details on exactly when the affair took place, but Celebrity Apprentice did film in late 2011 before airing early the next year. In October of 2011, Vanessa gave birth to the couple's fourth child, son Tristan. Wow, she's really red in the way that Don Sr is orange or sometimes yellow. twitchy2.0, Angeli, rollo and 1 others like this. I was about to say her fake tan is quite similar to her hair and it reminds me of the Flamin Cheetos that are more reddish than orange. With regard to the claims that Vanessa had to go to her mother for help sometimes, I can see that maybe being true. If Junior is anything like senior then maintaining control over everyone around him will give him almost as much of a chubby as extra-marital activities, and severely restricting access to finances is a known control tactic in destructive relationships. twitchy2.0, Brookie, MsDark and 4 others like this. witchcurlgirl, MsDark, needmeds and 10 others like this. What a world we live in. I cannot imagine a lawyer releasing a statement that talks about what I have 'liked' online. SHELLEE, pinkbunnyslippers, weathered1 and 4 others like this. I was thinking the same thing. I cringed when I read that. It sounds like something a teenager would use in defense. Is their no class left in the side chick these days? I don't think I would embarrass myself telling the world Daddy Trump or offspring were who I have had "affairs" with. Gross. Aubrey is back slithering her way into tabloids. Oh boy. Vanessa kind of reminds me of Reeva... Whatever her last name is/was. The one blade runner killed. I have to admit, I am kind of morbidly fascinated by the multi-generational pathology that results in a guy cheating on the still super-hot mother of his children to spend time with someone that looks like something that Buddy Velastro would put on a cake for an international firemen's convention. Nevan, dksnj, Trixie and 3 others like this.